When did modern humans settle in Asia ? When did modern humans settle in Asia and what route did they take from mankind’s African homeland? A University of Huddersfield professor has helped to provide answers to both questions. But he has also had to settle a controversy. Professor Martin Richards(who is pictured [left] with colleague Dr Martin Carr), who heads the University’s Archaeogenetics Research Group, co-authors a new article in the journal Proceedings of the National Academy of Sciences of the United States of America. 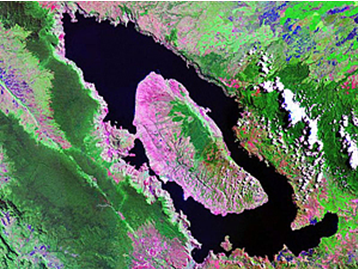 It refutes a recent theory, that there is archaeological evidence for the presence of modern humans in southern Asia before the super-eruption of the Mount Toba volcano in Sumatra. Map provided courtesy of Dora Kemp. ‌However, a team of archaeologists excavating in India then claimed to have found evidence that modern humans were there before the eruption – possibly as early as 120,000 years ago, much earlier than Europe or the Near East were colonised. These findings, based on the discovery of stone tools below a layer of Toba ash, were published in Science in 2007. Now Professor Richards – working principally with the archaeologist Professor Sir Paul Mellars, of the University of Cambridge and the University of Edinburgh, with a team including Huddersfield University’s Dr Martin Carr and colleagues from York and Porto – has published his rebuttal of this theory. In doing so, they have been able to draw on a much greater body of DNA evidence that was available for the earlier article. “One of the things we didn’t have in 2005 was very much evidence from India in the way of mitochondrial sequences. Now, with a lot of people doing sequencing and depositing material in databases there are about 1,000 sequences from India,” said Professor Richards. ‌By using the mitochondrial DNA of today’s populations and working backwards, and by drawing on a wide variety of other evidence and research, the team was able to make much more precise estimates for the arrival of modern humans in India. ‌The evidence suggests dispersal from Africa and settlement in India no earlier than 60,000 years ago. 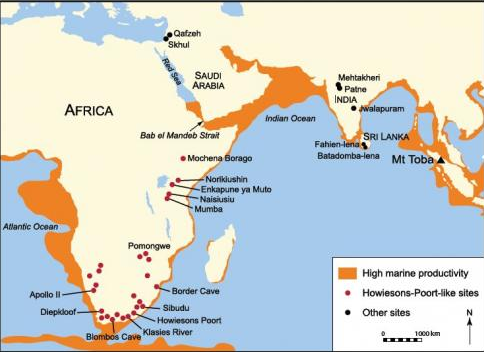 “We also argue that close archaeological similarities between African and Indian stone-tool technologies after 70,000 years ago, as well as features such as beads and engravings, suggest that the slightly later Indian material had an African source,” states Professor Richards. “There were people in India before the Toba eruption, because there are stone tools there, but they could have been Neanderthals – or some other pre-modern population,” he adds. The article Genetic and archaeological perspectives on the initial modern human colonization of southern Asia, by P. A. Mellars, M. B. Richards, K. C. Gori, M. Carr, and P. A. Soares is in Proceedings of the National Academy of Sciences of the United States of America.